www.go-elbrus.com - About us - Liza Pahl. Born in Munich, Germany, raised in the Bavarian mountains. After finishing her studies of Slavistics and Japanese with a master’s degree at the university of Munich, she moved to the Russian Caucasus in 1996. Skier (since the age of 6) and snowboarder (since 1990). Liza participated in most Russian freeride competitions and was Russian snowboard champion 2006 and 2009. She has also competed in international competitions in Austria, France, Switzerland and the United States. Still holding a German passport, she is taking part in most contests as a Russian rider. Participated in «Verbier Xtreme» in Switzerland 2007 and 2008. 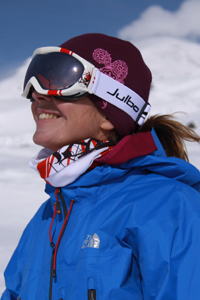 Liza works as ski and snowboard instructor and mountain guide. She has guided Elbrus more then 100 times and is certainly holding the record for climbing Elbrus among foreigners, though there are some Russians who have climbed more often. She was the first mountain rescuer with a trained avalanche dog at the Elbrus rescue team. 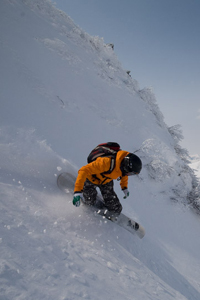 Has experience as heli-guide in Elbrus area and Kamchatka. Speaks Russian, German, English, French, Japanese and Arabic, and worked as interpreter for technical and commercial English and Russian. Even though she seems busy all the time, she will always find time for her language studies, some yoga exercises or long hikes in the wilderness of the surrounding mountains, working out new interesting routes. We want to show you the secrets of the wild nature and pristine culture of the mountains, the dessert, the sea, and help you to get good feelings out there. We have been guiding climbers, skiers, snowboarders, mountain bikers, ornithologists, geologists for more then 15 years. People from Europe, the United States, Kanada, Australia, China, Indonesia, Japan, Korea, Argentina any many many other countries have relied on our services. Our profile is organizing individually designed tours, as well as supporting extreme sports projects (filming, photo-shootings, records), and our guiding skills and knowledge of different languages and cultures allow us to do this allover the world.